Ah! There is nothing like the crisp, bright flavor of a properly fermented glass of Kombucha! Whether harvested fresh from your Kombucha jar or enjoyed after a second ferment, homebrew is the best. But brewing in the right Kombucha container for your needs is just as important as any other ingredient. Using the wrong kind of brewing vessel or spigot can even be dangerous. This makes selecting a safe Kombucha container or a few good Kombucha jars a critical step to success. While plain glass jars and some household items may be acceptable, beware of using just anything you can find. Many vessels are not a good choice due to the materials they are made from. The same can be said about many spigots. The questions below will help you select the best vessel for brewing up your own tasty batch of the booch! 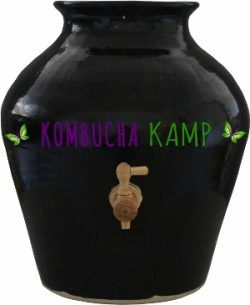 What kind of jar is best to make Kombucha? How large should my Kombucha Container be? Size for a BATCH BREW Kombucha Jar: 1-5 gallons recommended (4-20 liters). Smaller batches do not produce enough Kombucha to enjoy while larger batches may experience inconsistent flavor or slow fermentation. Not to mention that a huge vessel can be heavy and hard to move or clean easily! Size for a CONTINUOUS BREW Kombucha Container: 2-5 gallons recommended (8-20 liters). A smaller vessel will become overrun with too much SCOBY and sour Kombucha, making flavor balance difficult to achieve. This also means more regular maintenance, which is the opposite of our goal with CB. Larger vessels may be successful but can be difficult to accommodate in a home. *These estimates are made assuming ideal temperature and recipe conditions are met and based on personal taste preference. 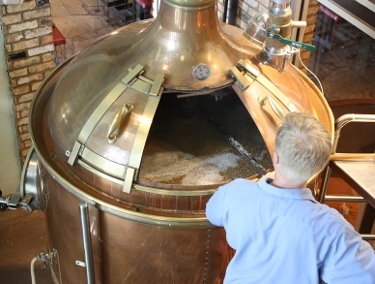 For Continuous Brew, the first batch would require the estimated times, but future brews will be ready faster. Click for more info on Continuous Brew Kombucha. 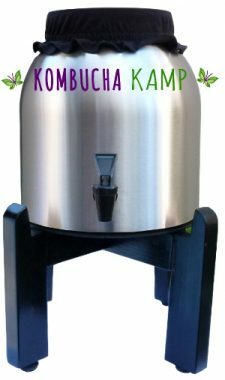 Should my Kombucha Container have a Spigot or No Spigot? Whether you are doing Batch Brew or Continuous Brew, a spigot can be pretty convenient. 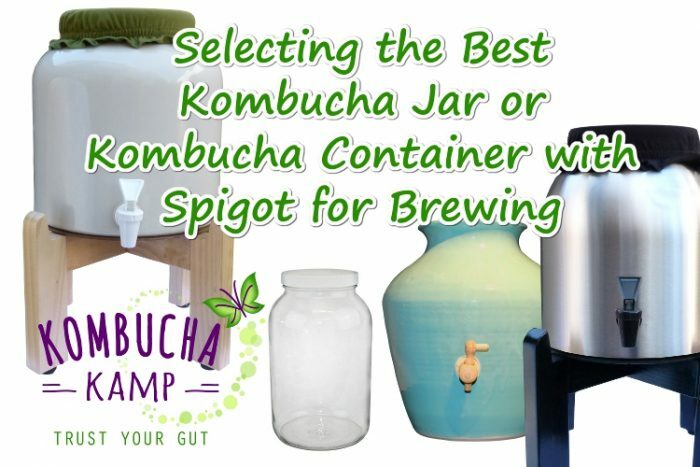 The spigot makes it possible to drain the liquid without lifting the Kombucha container. 5 gallons gets heavy! This reduces spills and saves the back from injury. When it comes to Continuous Brew, the spigot is pretty much a requirement. A siphon or ladle are messier and difficult, but can be used if no spigot is available. Smaller Batch Brew vessels such as a 1 gallon Kombucha jar are lighter and easier to handle. For this reason, a spigot is often not available or even necessary. Most importantly, the spigot must be made of materials safe for brewing. Click Here to Learn More about Selecting a Spigot for your Brewer. 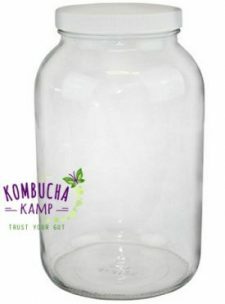 What shape should my Kombucha Jar be? The shape of the vessel influences Kombucha’s fermentation speed. The more surface area and the less depth, the more oxygen present in the brew. More oxygen results in highly stimulated bacteria and yeast, and therefore a brew that is ready faster. Taller, narrower vessels will mature more slowly, while shorter and wider vessels will make Kombucha more rapidly. This effect is more important in larger batches or Continuous Brew. The shape of a 1 gallon Kombucha jar will have less effect due to the smaller batch size. Avoid extremely wide and shallow vessels which turn the flavor sour very quickly. Similarly, avoid a very tall and narrow Kombucha container, which can ferment slowly and unevenly. One other consideration is the size of the Kombucha jar opening. The “mouth” of the jar must be wide enough that we can remove the new SCOBY that forms during the brew. Narrow openings also prevent the oxygen from flowing to the brew. For this reason, avoid using “carboys” and most other beer brewing vessels as a Kombucha container. Does the Kombucha Jar affect the flavor of the brew? 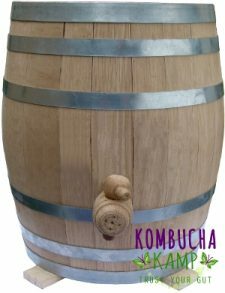 The only brewing vessel that changes the taste of the Kombucha is the wood barrel. The wood is usually charred on the inside to induce a smoky flavor into the Kombucha as it brews. All other recommended vessels are non-reactive, producing the same “clean” flavor. If there are any problems such as mold, they are easily visible by looking at the top of the brew. For this reason, many experienced brewers end up preferring an opaque vessel. Or they may use cloth cover t-shirts for their glass fermentation vessels to block the view. Finding a jar you already have on hand or can recycle is one good option. Most canning jars are smaller than the minimum recommended size of 1 gallon, but even an old large pickle jar will do if well cleaned. Another option is to select new high quality American Glass for your Kombucha jar. Always be sure the opening is wide enough for removing the SCOBY after the brew is complete. This eliminates beer brewing carboys as an option. If the jar has a spigot, watch out for low grade materials which can leach chemicals or off flavors into the brew. Click here to jump to the section about selecting a safe spigot for fermenting. Glass is also the best option for bottling your homemade beverages. Learn more at our post about Bottling and Flavoring Kombucha and Other Ferments Safely. *Reminder – a 1 gallon glass jar such as a “Sun Tea Jar” or similar is not a good choice for Continuous Brew as it is too small. The spigot is also likely to have parts that are not safe with Kombucha. Food Grade Porcelain, Ceramic, and Stoneware. These materials are historically the most commonly used for fermentation. Their opaque nature prevents light from affecting the brew and provides for a more discreet brewing experience. Porcelain, Ceramic, and Stoneware pieces made for food use in the 21st century are generally safe to use. The main concern would be lead, but food safe items are made with lead-free glazes. Still, many people accidentally choose a decorative vase or pot for brewing, which can be dangerous. Home lead tests can confirm if a vessel is safe to use. Or simply source your vessel from a trusted supplier. KKamp Modern Porcelain and USA Handmade Stoneware vessels and supplies are always guaranteed safe for brewing. Any Kombucha vessel we offer can also be used with JUN or Kefir. Stainless Steel. Most metals are not acceptable for brewing Kombucha tea. However, high-grade stainless steel 304/316 or better is the only exception because it is non-corrosive. The good news is that safe stainless steel Kombucha brewing supplies are readily available. Stainless steel is very durable as well as light and easy to clean. This makes it a favorite of the professional brewing industries, including beer, wine, and vinegar. Because it is lightweight, many clients appreciate that it’s easier to handle when it’s time to do maintenance. A stainless steel Kombucha container also offer a matching aesthetic for homebrewers that already have stainless steel appliances, or anyone that just likes the look. While it’s a good idea to be cautious with metal and Kombucha, unfortunately there is a lot of confusion. Many websites incorrectly claim that all metal “kills” the SCOBY. This old-wives tale captures the concept but confuses the details. Metal does not kill Kombucha. Rather, Kombucha is a powerful liquid that can leach toxins from metal (or any material) if left in constant contact. Briefly using a metal spoon or mesh strainer is not likely to cause an issue. However, using brass or aluminum vessels or fixtures, common in beer brewing, is unsafe with Kombucha. Stainless Steel’s non-corrosive properties eliminate this issue. This can also be important when it comes to the spigot. Always confirm that the internal parts and connectors are metal free prior to use with Kombucha. Or choose a Stainless Steel spigot, which is compatible with any vessel. Learn more about KKamp Stainless Steel vessels here. Wood Barrels. Wood barrels, traditionally made from oak, are some of the oldest fermentation vessels out there. Vinegar (Kombucha is an acetic acid ferment, just like vinegar, hence the similarity in taste) has traditionally been brewed in oak. So to are wine, beer, pickles and sauerkraut to name a few. The toasted wood interior imbues the ferment with a unique flavor profile. Some say it provides hints of vanilla and smoke. Others find that it smooths Kombucha’s tangy bite. We let our oak barrel Kombucha ferment longer to create Kombucha vinegar to use in salad dressings and marinades. Some commercial brands brew solely in Oak Barrels as they find that consumers enjoy the toasty flavor. Being a porous vessel, there are some specific handling instructions to keep in mind. For one, the barrel must be kept full or near full at all times. This is because when the wood comes into contact with water, it releases natural sugars. Those sugars will attract a variety of critters including mold. The high level of alcohol in beer and wine casks or the high amounts of brine in pickles and kraut prevent mold from taking hold. In Kombucha, it’s the low pH of the brew that keeps these fuzzy buggers at bay. Since the wood is porous and the bacteria are microscopic, some of them will take up residence in the sides of the barrel. This means that when you open it up, you may find that the SCOBY is literally attaching to the side of the barrel. Simply take a spoon or finger and run it along the inside edge to dislodge the new culture growth before topping off with sweet tea. Barrels also have special storage instructions between uses. Most will choose to keep the barrel full of Kombucha and return to restart it when they are ready. The benefit is that the wood staves remain saturated so the barrel doesn’t need to rehydrate/seal again. Those who choose to air dry it will need to reseal the barrel in order to restart it. 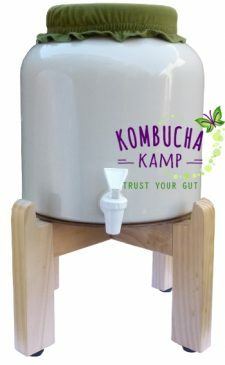 Kombucha Kamp barrels come in two sizes and feature a larger opening at the top for easy access to the culture as well as a higher spigot placement to prevent over draining and clogging with yeast. Caution Note: Watch out for suppliers that offer metal spigots with barrels. These are often made of brass, which is safe with higher pH beverages like beer, but not safe with the low pH of Kombucha which can leach toxins into the brew. KKamp Barrels come with a stainless steel spigot option, safe for use with Kombucha. Check out our Barrel Packages here – they also work great for Jun! Professional Grade Plastics type 1 & 2. Some in the commercial Kombucha industry use food grade plastic due to its low cost, ease of sourcing and lighter weight. However, many will acknowledge that unless it is HDPE (high density polyethylene), it will crack and break due to constant exposure to the low pH of Kombucha. So while it can be cost effective for short term use, most brewers eventually graduate to stainless steel or other materials. However, for spigots, professional grade plastics work very well and last indefinitely. Consumer Grade Plastics, Rubber. There are a large variety of “lemonade dispensers” and other beverage holders that are made partially or fully from consumer grade plastics. Due to the high acidity of Kombucha, KKamp does not recommend using any vessel that has a plastic part. This includes low grade spigots with “milky” white plastic components. Similarly, vessels with rubber gaskets, liners, or connections are an unsafe choice. Crystal, Colored Glass. Crystal glass often contains lead and is not safe for brewing ever. Colored glass items such as punch bowls or vases may or may not be safe for brewing. With so much variation in production and uncertainty around materials, KKamp recommends using only clear glass items for brewing. Vintage/Decorative Porcelain or Ceramic. If the item was not intend for food use, it’s risky to try with Kombucha or any home ferment. Avoid pretty vases or flower pots or neat-o thrift store finds which can leach dangerous chemicals into the brew. Aluminum, Brass, Cast Iron, Low-Grade Stainless Steel. 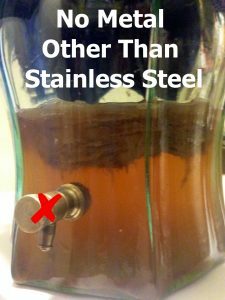 This one can be a little confusing, because high-grade stainless steel is a great option for Kombucha. Also aluminum and brass are fine choices for beer brewing. However, these materials cannot be used with Kombucha or JUN. The low pH of the brew will leach toxins from these vessels into the liquid. If you prefer metal, use Stainless Steel 304/316 grade or better vessels and supplies. Many beverage containers are made for low acidity drinks such as water or iced tea. The spigots on these vessels are safe for those type of beverages but will not hold up over time if used with Kombucha. Specifically, these consumer-grade spigots are usually semi-hard plastic, sometimes with a “metallic” coating. This can erode over time, wearing off or even chipping off into the brew, even if the coating is only on the outside. Additionally, these spigots are made from a lower grade plastic that is more translucent and white. These materials are not made to be in constant contact with very acidic liquid like Kombucha. 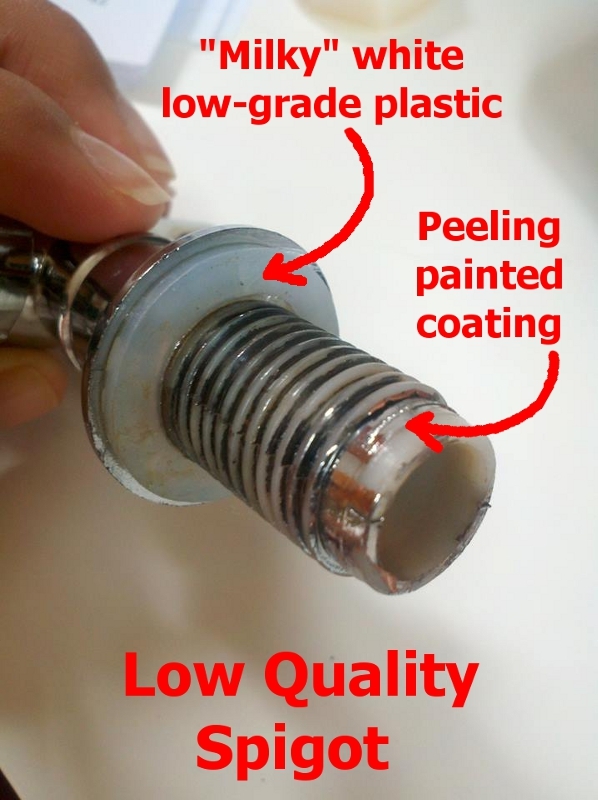 If choosing plastic, we recommend only high-quality hard plastic spigots without coating or paint of any kind. These professional-grade spigots, washers, etc are made from the same material used by commercial brewers of all kinds of high acidity beverages including beer and wines. 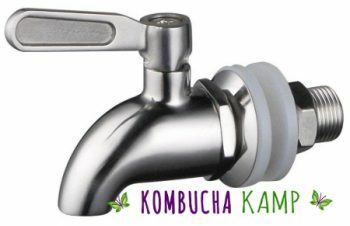 Other options include stainless steel spigots or all-wood spigots, both of which are safe with Kombucha. All of that said, there are many people out there using found containers or smaller glass vessels. Just keep in mind that the liquid is in constant contact with the inside workings of the Kombucha container and the spigot (including the washers, nut, etc.) and will leach whatever it can from those materials. Kombucha is not safe with any kind of metal except stainless steel (304 grade). If it is actually metal such as brass or aluminum, it is very dangerous and should not be used. It’s also important that you can remove the spigot completely from the Kombucha container for cleaning. No adhesives or glues should be used to hold the spigot in place, and each part of the spigot should be made from one solid piece of high quality plastic. Avoid epoxies or other joints that could erode due to the Kombucha. What can I use to cover my Kombucha jar? 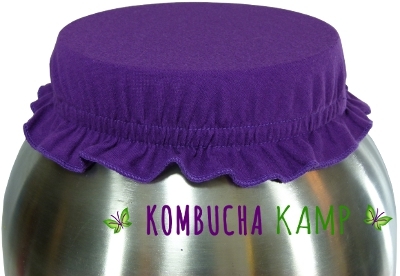 For best results, Kombucha requires a breathable, cloth cover. Cotton is the best choice. However, the weave must not be too loose. If it is, fruit flies, mold, and other contaminants will get into the brew. For this reason, NEVER USE CHEESECLOTH! Not even if you fold it up many times! The flies can still weave their way in and ruin the brew. Find a quality cotton Kombucha cover instead. A re-purposed old t-shirt or sheet can do the job in combination with a rubber band. For more stylish options, look at these Hand-Cut Cloth Covers. Or explore Fermentation Caps in a variety of sizes for your Kombucha jar and more. How do you clean a Kombucha jar? If this is your first ever brew, or there was mold in the previous batch, clean the Kombucha jar thoroughly. We recommend washing with soap and water to remove any mold, dirt, or greasy residue. Then rinse the Kombucha jar very well with filtered water. Any soap left behind could harm the brew. Optionally (especially if you had mold), you may also “cure” the brewing vessel with distilled/pasteurized white vinegar. By the way, if you’re not sure about Kombucha mold or want to learn how to avoid it, click here. If the previous brew was successful, it’s likely fine to rinse the Kombucha jar in filtered water and start again. The low pH of the brewed Kombucha acts like vinegar to cure the jar already. So if the brew was a success, no mold or other issues with flavor, there is no need to clean. Just brew the next batch, no worries. Of course if you want, you can always wash and cure the Kombucha jar between every batch. But in most cases, it’s not necessary. NOTE: Never use raw vinegar for curing to avoid contaminating the brew. Curing the vessel means adding a small amount of vinegar and rolling the liquid around. Coat all the interior surfaces of the jar. Then dump out the residual vinegar and brew as normal. This sets the pH of the jar so that mold or other contaminants cannot cause brewing problems. NOTE 2: Harsh chemical sanitizers such as those used in beer brewing or commercial facilities are not required. Kombucha is safe for home fermenting without these due to the low pH. Read more about Kombucha pH here. NOTE 3: Removing mold from a wood barrel requires a different process. Rather than washing the inside with soap and water, use these special Kombucha Barrel Sanitation Tablets. How do you heat a Kombucha jar? The recommended temperature for Kombucha is 75-85°F (24-30°C), with the ideal temp being about 80°F (27°C) (75°F [24°C] for JUN). If it brews at lower temperatures, one may experience a flatter, more “dirty” tasting Kombucha that lacks the apple-y sour bite of a delicious, properly brewed Kombucha. Allowing the brew to go for a longer time at lower temperatures (mid to upper 60’s) will help it grow more sour and should produce a safe, drinkable beverage over time. Attempting to ferment at lower than 65°F (18°C) may produce a weaker beverage or may be susceptible to mold as the microorganisms get “sleepy” and have a difficult time protecting themselves at the low temperature. Finding a warmer spot in the kitchen, wrapping the brew in a towel or blanket or placing next to a working appliance are some ways to increase the temperature. If you find you still need a little heat for the brew to produce the best results, it’s very important to heat the brew from the sides, not the bottom. Heating from the bottom does not allow the yeast to come to rest during the brewing cycle. This can lead to sour, unbalanced brew. By heating from the sides, we deliver the warmth to the top of the brew, where the bacteria can use it to complete the cycle. These high-quality heaters were invented by KKamp and are used by thousands of clients all over the world. They are made from very energy efficient and safe materials, so you can leave them running 24 hours a day. Learn more about heating all your brews, plus a secret tip on getting the best carbonation by using the heater, by visiting this page about Kombucha Mamma Heating Solutions. Can you brew less than 1 gallon of Kombucha? Yes! Most people prefer to make larger batches so they don’t run out while waiting for the next one to be ready. Longer ferment times also reduces sugar and allow more acids to form. However, some prefer to make smaller batches for a shorter fermentation time, like the old days in Russia before Coke & Pepsi arrived. This kind of process yields a sweeter, more soda-like beverage that is still healthier than what you would find at the grocery store. Remember to cut the standard Kombucha recipe by half or a quarter when making smaller batches. Batch Brew Kombucha vs Continuous Brew Kombucha – Which is best?